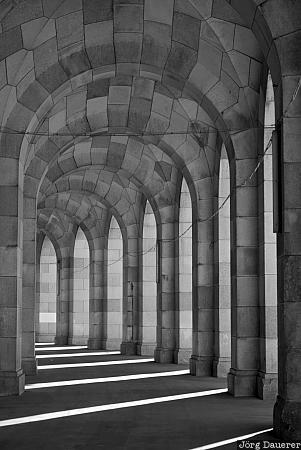 The back-lit columns of the arcade walk of Congress Hall (Kongresshalle) - a part of the Nazi party rally grounds (Reichsparteitagsgelände) south of downtown Nuremberg (Nürnberg). Nuremberg is the biggest city in Middle Franconia (Mittelfranken) in northern Bavaria, Germany. This photo was taken at noon on a sunny day in November of 2010. This photo was taken with a digital camera.